No me convencen varias cosas de este dibujo, y confieso haber tenido varios bloqueos mientras lo hacía. Aún así, es refrescante hacer algo con tonos cálidos de vez en cuando. Illustration based on a mini novel I'm reading ... 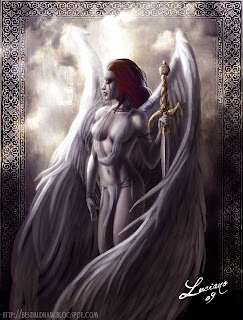 The novel does not include swords or angels, but the author wanted this way ´cause it´s the vision she had of the protagonist. You can pass by his blog HERE. I am not convinced about a few things from this picture, and I confess to have had several crashes while doing so. Still, it's refreshing to occasionally do something with warm tones. 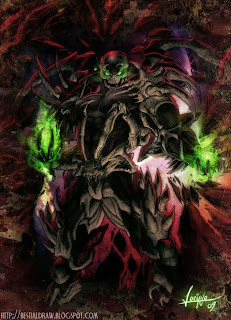 Siempre me pareció genial el universo Spawn, y el engendro (en sus multiples personificaciones) me resulta fascinante para dibujar. Este lo tenia archivo hace rato . . . Honestamente estoy con poco tiempo y ganas. Sin mencionar que estoy metido en un nuevo... em... "proyecto" en conjunto con 4 personas creativas :D . . . Ya que estan se pueden pegar una vuelta por PERPETUUM MOBILE que les aseguro que van a encontrar cosas interesantes . . . Todavia no subimos nada pero mientras tanto pueden jugar con un movil perpetuo para ver de que se trata. I´ve always loved the Spawn universe, and I found the character (in his multiple personifications) really fascinating to draw. I had this one filed for some time. . . Honestly I have no time or mood. Not to mention that I got a new ... mm ... "project" in conjunction with 4 creative people :D. . . Anyway, you can take a look at PERPETUUM MOBILE where I assure you will find interesting things. . . We still didn´t upload anything but meanwhile you can play with a perpetual mobile to see what´s all about.